Summer is coming to an end. But what better way to celebrate the end of a fantastic sunny season than spending a few hours on the water with the friends and family of Yak Womyn. 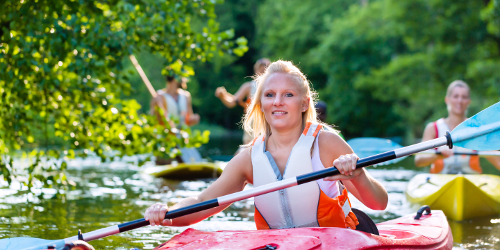 Yak Womyn was established in 2007 as a paddle group for womyn and their friends with kayaks, canoes or whatever floats in the Greater Ann Arbor area and beyond. The group spends two to three hours most Sundays paddling down watersheds located conveniently off I-94 and I-23 in the Brighton, Huron-Clinton, Irish Hills, Jackson, Pinckney and Waterloo Recreation Areas which offer more than 50 lakes and rivers. Yak season is April through October. Life jackets are required to be on the boat. Contact Sandya at sapphosis@yahoo.com to participate.